When you have back discomfort or pain (mild or severe) it could be due to overuse, muscle strain or sometimes thoracic kyphosis. A doctor has many ways to diagnose thoracic kyphosis including physically examining you to see whether you have bad posture. He or she will examine the curvature of your kyphotic curve, which is a type of curve that is present in the spine around the chest area. It is this curve that determines your posture as you walk, sit or stand. An exaggerated kyphotic curve (curved more than 40 to 45 degrees) is a sign that you may have thoracic kyphosis. When your spine is injured there is a huge risk that you will develop kyphosis or experience nerve problems in the spine. Injuries likely to lead to kyphosis include those that cause a vertebral fracture in the thoracic spine. You run the risk of fracturing your vertebrae in accidents involving horse riding, motor vehicles, falling from a great height and so on. Doctors may ask you if you were involved in an accident before you developed the condition as one of the ways to diagnose thoracic kyphosis of this type. Sadly, when a genetic mistake occurs in your body before you are born, it can result in the failure of formation or segmentation of the front part of one or more vertebral bodies and discs. This defect leads to the abnormal development of the spine as you grow, and it may continue affecting you in adulthood. Kyphosis developed as a result of a genetic mistake is what is called congenital kyphosis. After surgery done to correct problems on your spine, there is a chance that you may develop kyphosis. This mainly happens when the area that underwent surgery did not heal properly. The most likely solution is for you to undergo a second operation to correct the problem. Sometimes called “round back”, postural kyphosis is caused by poor posture and normally affects young adults and adolescents. It is the most common type of kyphosis and can easily be corrected by literally standing up straight. It is not caused by any structural problems or abnormality of the spine and it is unlikely to progress. Doctors may use many ways to diagnose thoracic kyphosis of this type, but they are more likely to look at your sitting posture or standing posture. You may have seen cartoons develop this kind of kyphosis when they are sad or lack confidence. It is considered as the most common type of structural kyphosis and people who have it have a thoracic curve of 40 to 75 degrees. In this case, your kyphotic curve becomes abnormal because of the wedging of three or more vertebrae in a row. Unfortunately, experts still do not know the exact cause of this type of kyphosis but some believe that it could be a result of abnormal bone growth and development. It is normally diagnosed between the ages of 12 and 14. You may develop kyphosis from any condition that can decrease the height of the front part of the spine. For example, older adults, especially females, can develop kyphosis caused by osteoporosis because the condition can lead to crushed vertebrae. 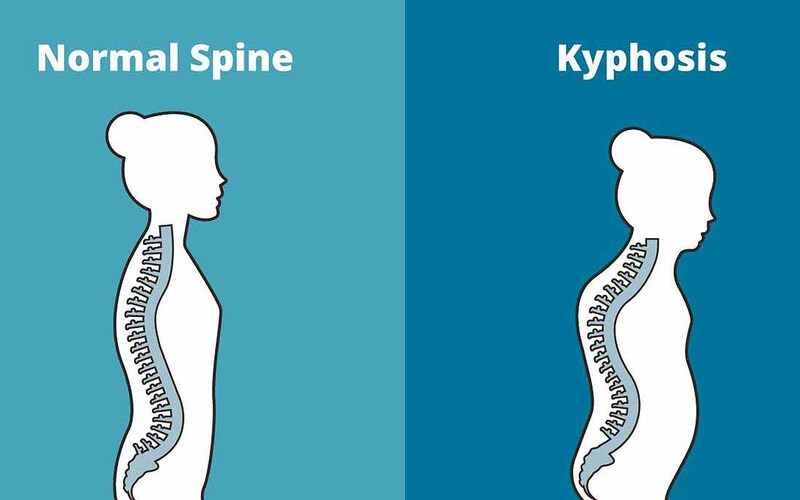 Other ailments like infections in the spine, cancer in the spine and some types of arthritis can also cause kyphosis. You may experience pain in the area of the kyphosis, which could become severe and disabling if nothing is done to treat it. Severe cases of kyphosis have also been known to reduce appetite because the curve may cause the abdomen to be compressed. Your lower extremities could also experience weakness when the curve is severe and puts pressure on the spinal cord leading to compression of the nerves in the spinal cord. A thoracic spine curve could also make it difficult to breathe and may also affect the function of your heart. When you spot these symptoms, it is important that you see a doctor for a diagnosis so that an appropriate treatment plan can be developed for you. The doctor will perform a physical examination and then measure your spine’s overall curvature during an x-ray evaluation. He or she may also ask for your medical history so as to rule out any other possible causes of your kyphosis. Once the x-ray evaluation confirms the kyphosis the doctor may order other tests. For instance, the doctor may order an MRI scan to asses if there is any encroachment on the nerves or to predict the progression of the spinal deformity. You may also undergo a CT scan especially if the orthopedist suspects you have an injury that does appear on your X-ray. This is mostly recommended if you are experiencing stiffness or pain from your kyphosis. Your physical therapist will design an exercise program that will work best for you as an individual. Your exercises may involve things like core muscle strengthening and aerobics. Back braces are normally recommended for curves that progress and are meant to straighten the spine to prevent further progression. They are not meant for kyphosis treatment in adults but for patients who are still growing (like adolescents). 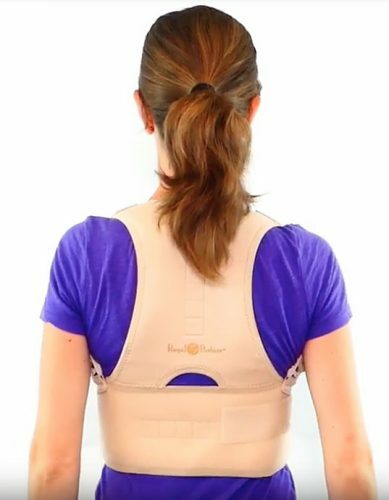 You can use a posture corrector or a posture corrector shirt. Going the route of surgical intervention is only recommended for patients who have tried other treatments but those treatments have failed to work. Surgery may be suggested to reduce the deformity, stop the deformity’s progression, remove pressure from the nerves and spinal cord and protect the nerves and spinal cord from further damage. Please leave a comment or a question about ways to diagnose thoracic kyphosis and treatment and we will get back to you as soon as possible.